Tamara won the cook off with the Mac and Cheese against the boys. Tamara had one out of 4 choices of making a herb the star of the dish. From the song Rosemary and thyme. That’s right the star of the herbs, Parsley, Sage, Rosemary and Thyme. Firstly this needs to be be addressed, Shannon had white shoes on tonight not the cool fly net red ones that from a distance look like crocs but where really cool nikes. Tamara on her way to making a dish she is very good at – dumplings with a rosemary and roast chicken broth. Shannon advised to work on the broth first to get more flavour but Tamara wanted to get the dough right for the dumplings or there is no dish – good move – who will know. 15 minutes later Clinton started as cool as Tom Cruise on Top Gun. Explaining a part of his dish with an orange pit puree, picked mushroom, rosemary ash with lamb. 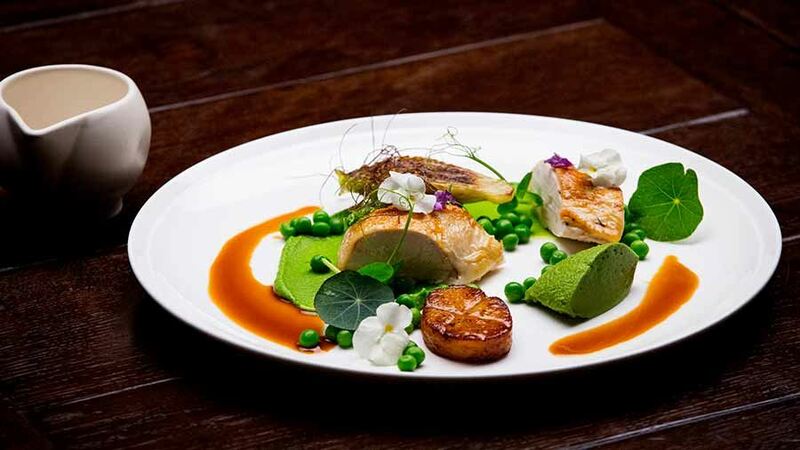 With so many elements to put on the plate with true experienced chef style he gets everything on the dish. 5 minutes to go and Clinton is so relaxed. Shannon advised Tamara to make a crunchy piece from the wantons – great idea with two crunchy elements and a broth. Scoring is so close and Tamara missed out by one point. She can hold her head up high with a fantastic dish. Another elimination. Here we go! A normal pantry of staples without cream but yoghurt instead. Nicole and Arum off first with the most time. Ben off with 55 minutes. The 22 left are split up into 4 teams – Red, Green, Yellow and the Blue team. The first group are chosen. Benita, Tamara, Benjamin and Diana. Two points for Ben’s start on ice-cream. Unlike Trent who put the jelly in the fridge. 45 second changeover the baton – practicing for the commonwealth games. Ben comes second for the green team, Trent for the red, Elouise for the yellow and Sarah for the blue. They put up their hand on who wants to go next – they get chosen who is next and are given the apron just before they run in. Next set 45 seconds Sam hits the red team, Nicole green team, Bryan on yellow and Michelle for the blue. Bryan came in an added a pickled apple. Michelle could be steaming the a buns that will stick to the steamer. Callan is red, Aurum now green, Eliza jumps into yellow and Karlie is blue. Poor Karlie – buns are doughy and wet, coleslaw is wet – decides to make the classic Asian pancake – will she get the time. Gets the team back on track. Ray does red, Jeff goes for green, Sam in yellow and Jess is on the blue team. Ray wonders what plate to use – seriously get the stuff on the plate and he forgot the jelly. Green team chili mud crab not so mapley – in the elimination round. Green team that are going to elimination. Andy Bowdy the cake wizard names his cakes after special people in his life. Let me tell you his Grandmother must be a special lady with the sky scrapper of a cake he created. I can’t even tell you the amount of layers and ingredients as it was so fast. 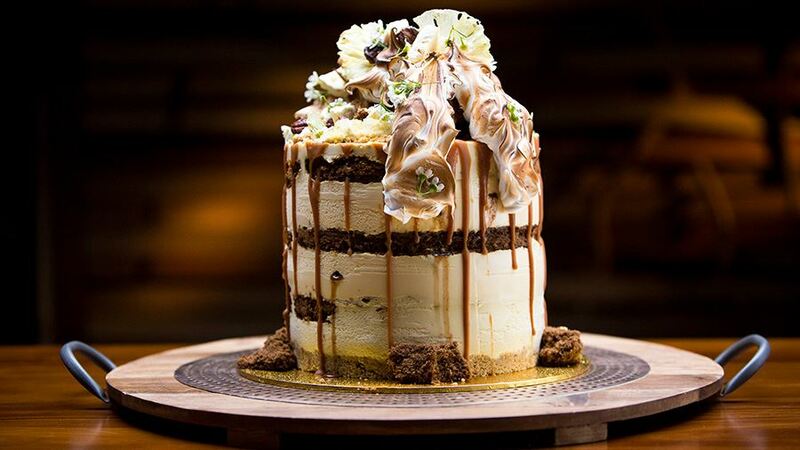 Looks like 8 – 9 layers with all different ingredients. The complexity in the cake masterpiece giving the elimination round with Pia, Pete and Ray a 4 and 1/2 hour window. Some advice from Andy, don’t mess with the Bavaroise (prounced Babwa). Now don’t get this word wrong as a “Babwa” – Slang term used to communicate with an inferior primate. While Bavaroise is French for Bavarian Cream. Don’t under cook it won’t hold in your cake, don’t over cook it as it will be too hard. Don’t stuff up the meringue, too soft it will be look a soup. Too hard and the meringue in shapes will just break. I can’t tell you if Pete has sugary nuts but if you don’t watch your nuts their going to get burnt. Pia – gets a fast pass on the custard and using the mixer – could be a bad mistake. The chefs say you’ve made it before nothing different. Ray seems to be in the A&I in the hospital just calm and moving through the cake pieces and in control. Pia slightly behind, meringue was a bit deflated. Second batch coming up and looking great. Pia’s custard is starting to set and it doesn’t look as airy as the others. Peter even with over cooked nuts seems to be on track. Coming down to dressing the cake – great job. Pete’s cake was great, it turns out that Andy may try burnt nuts in a future version – LOL. Ray next up – looks great with a slight bulge in the bottom of the cake. Pia worried abut her passion fruit Bavaroise – as you would be! Pete safe, and unfortunately Pia is going home. First immunity challenge of 2017 an all girl power event. Now the immunity challenge wouldn’t be the same without Shannon Bennet helping the team – he’s back to assist them 23 in every immunity challenge. The girls have 32 minute to make a nutritious savoury for a family for 4. Choose ingredients from the pantry but you can’t go back to the pantry. Game on very little time. Eliza will she have enough time to cook the a whole rack of lamb. Everyone said do you have enough time – well it turns out that everyone was right – its not cooked. Unfortunately Eliza one of her lambs were still going baaahhh. Sarah where’s the rice? Sarah wins the immunity challenge by a large distance. Now up against Jarrod Di Blasi. 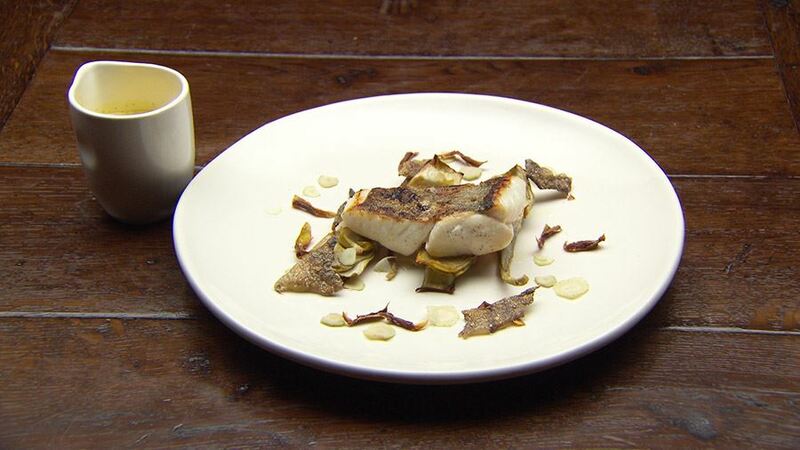 Ingredients from the chefs homes and Sarah chose Gary’s fridge – very Asian inspired. Has Jarrod taken an easy way out to his demise, I mean seriously world class chef doing whiting sashimi with an avocado sauce. Shannon strongly suggests to him that it’s not enough. He’ll need to rethink his menu. He comes back with pickled onions and gherkins for base, crisp kale and a plate that looked spectacular. Sarah created an XO steak with picked mushroom and it looked great, question over the mashed potato but her first potato idea was burnt. Total score of 23. Jarrod with 27 took out the immunity challenge. Sarah can be proud of a great dish and this is just the first one. More Master Chef to come – can’t wait! Roast chicken , peas and potato – sounds easy. Pot of water on the boil. Nice brown look on the top, cook the bones, chop the shallots, carrot, garlic in a bowl and cook. Peas, spinach and a pinch of salt, puree. Lee is too slow and Ray is behind it’s going to be close for the elimination. Doesn’t look that hard sitting in my pajamas and saying come on mate hurry up. Ray falling behind and burning the set down – just jokes. I know he’s a doctor but instead of walking with a flaming saucepan you can just put a lid on it. My wife says that if you like it you should have put lid on it. Lee has pink chicken on the inside and needs to flip it. Two pieces of chicken one fondant potato, pea base and pea custard. It’s looking close, Due to an earlier error of 150ml of cream instead of 50ml of cream Ray’s custard never set- now that’s a dosage error. Luckily no-one who’s lactose intolerant will be tasting it tonight. Unless someone else has a major mistake then I think he’s going home. 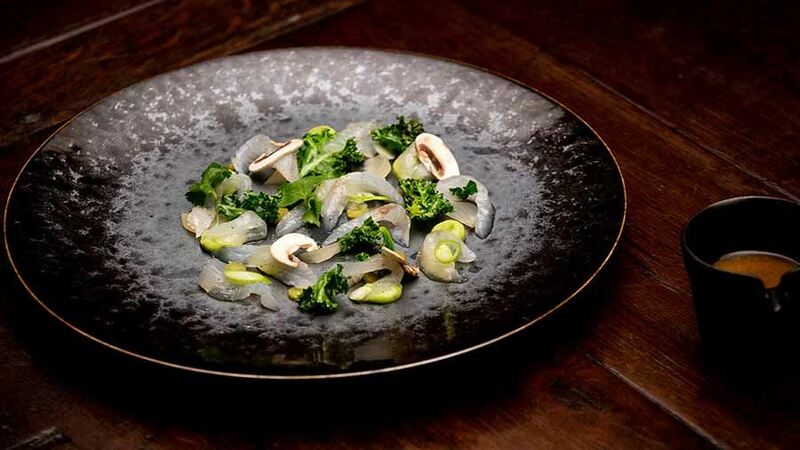 Pete has lifted himself (with a crane) from the doldrums to create a really great dish. Ray with a separated cream and over cream custard. Lee then served up under-cooked chicken at it’s all over. Lee good luck for the future! It’s home cooking week with the lock up of the Sous Vida machines, the blast chillers, the ice-cream makers, yoghurt makers are all gone. The funny thing is, if I have these ingredients in the fridge I’m high fiving myself for having enough ingredients to get dinner ready. The rules are 75 minutes using at least one of the ingredients and you have the use of staples. They are only tasting the 5 most appealing dishes with the winner getting the advantage for the invention test. Ricotta doughnuts with a pineapple syrup. Grilled prawns with Parmesan tuile and cream and anchovies sauce. 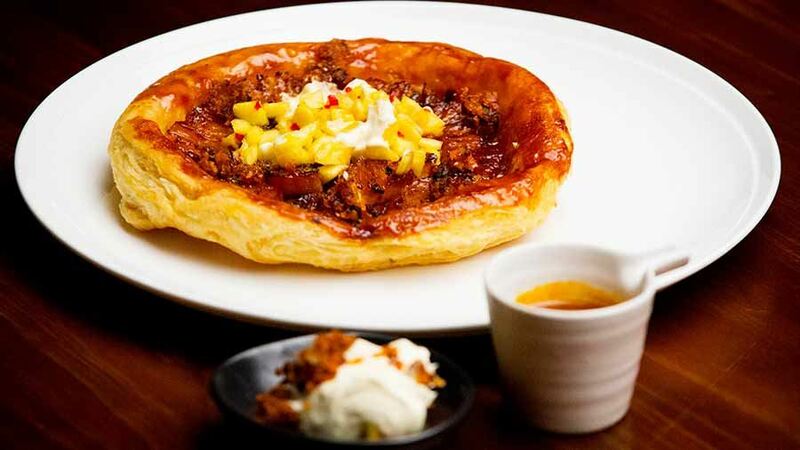 Eliose cooked a Pineapple Tarte Tatin with Pumpkin Chilli Caramel and Toasty Bits. 5 great dishes. The choice was hard. Callan was way out of his league, one thing about Master Chef if you are just great at molecular gastronomy it’s going to get harder for him as the weeks go on. Eloise cam out on top! The three ingredients were from George’s Mums pantry. Fennel, mussels or Ceder Street haloumi made from buffalo – and she chose the haloumi. Garden and pantry are in play. Top 3 go into the first immunity challenge and the bottom three in tomorrows pressure test. 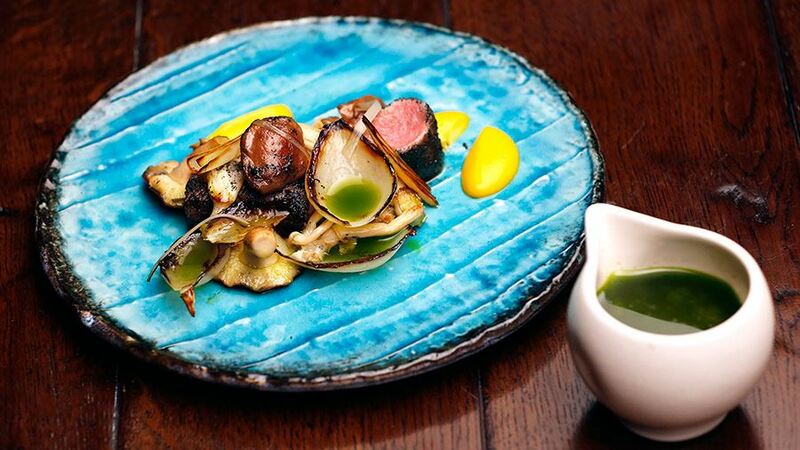 Pete was creating a Heston inspired lamb dish and apricot gel instead of a lime gel with Dukka – hey can can make this gel with out Agar Agar. It looked pretty awesome – plug product here LOL. Second guest of Master Chef 2017 was none other than Elena Duggan last year winner of Master Chef. 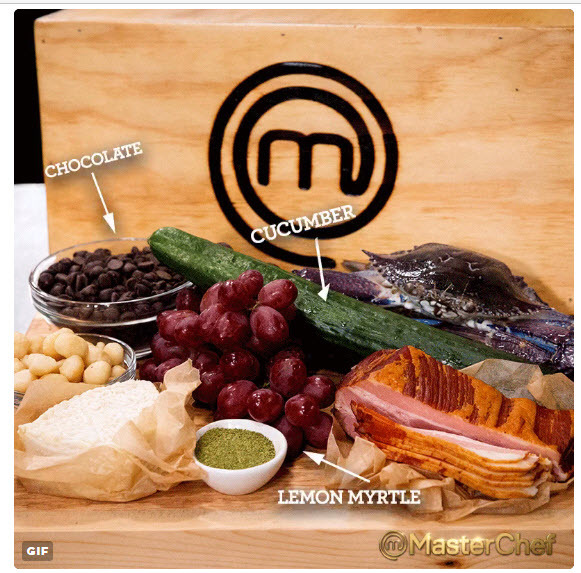 Elena has come up with the ingredients for the first mystery box for the Master Chef 2017. The 1st challenge for the Master Chef ’24’. Watching from the sidelines we saw Benita having to change from a basic bisque to a totally new recipe. There is nothing like having to be adaptable in Master Chef. Brian was first up with a cheese board with lemon mrtyle and cucumber ice-cream and the rest holy crap. Over 7 elements – setting the bar. Next Pia with a ravioli with goats cheese and lemon mrytle. Followed by Tamara, Arum, Karlie and Samuel. Fast forwarding for the time slot. Benjamin creates a crab fettuccine and over cooked the pasta. Sorry your off to sudden death. Benita – needed more time for presentation, presentation, presentation. Needed to have a more challenging dish – off to sudden death. 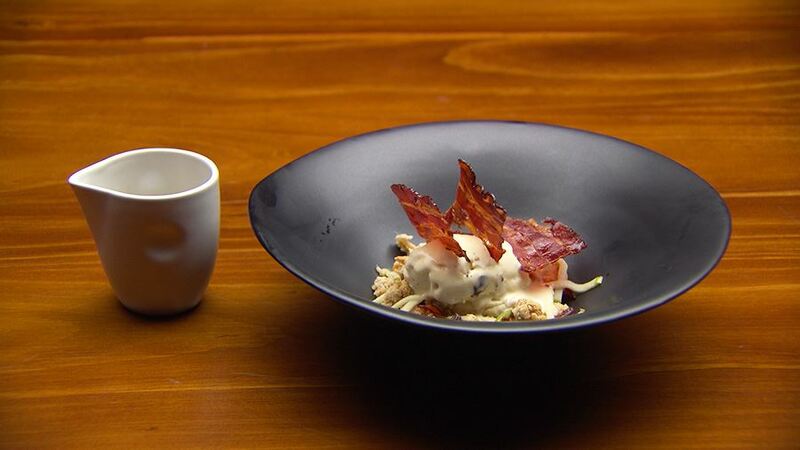 Eliza – beautiful dish with a perfect chocolate fondant, smooth texture and crunch – nailed the ice-cream well done! Get ready for another writing speed up of contestants: Jesse – in, Michelle in, Peter delicious, Nicole loving it. Then Lee brought in a crab salad, bisque, mousse, too mushy needed to edit his choices. Sam created a cheese, wine and chocolate dish -really clever cooking your safe! It sounds like they are running for bases in baseball – your safe on home plate, except the plate is food and your running for 75 minutes. We get to the 18 year old Callan with what can only be described as a gnarly – street fighting dish, desert or savoury crazy wonderful dish. Here is the good news: Sam special mention, Pia one to watch, Callan love the way you think about food suprising and delicious and Brian’s complex and uber tasting desert. 75 minutes your time starts now. It was pretty cool to watch Benjamin role some dough into a big circle passed down from his family. Not the greatest cooking we have seen. Out of Rashedul and Benita, Rashedul was the first contestant to be eliminated from Master Chef. It’s humbling to know that systematically we sill see another 22 be eliminated – Can’t wait!!! 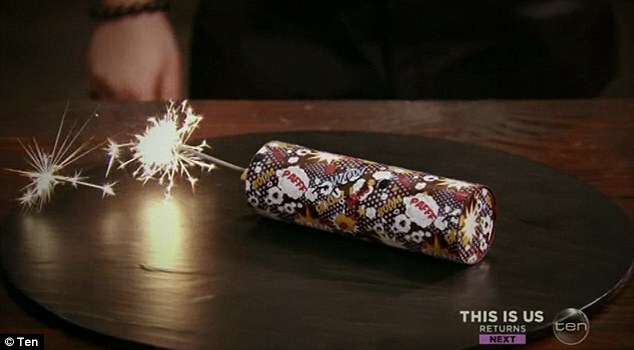 Anna Polyviou Boom Boom Kaboom – What A Cracker! Stephen here, Julies’ husband giving you the run down on tonights Master Chef. The sacred 24th apron up for Grabs. 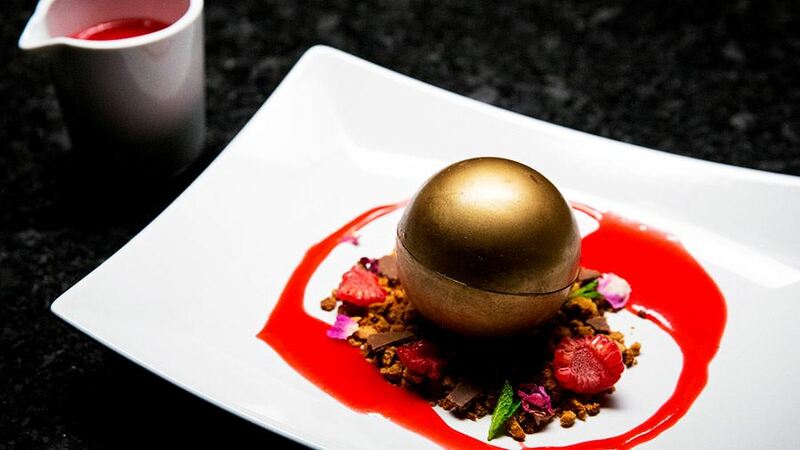 The desert from one of the greatest desert Chef’s world wide Anna Polyviou created a firecracker with the theatre of the kaboom, boom and the bang. A 70’s pop art inspired transfer on the cover with chocolate with over 10 different elements inside the firecracker. Christina who went through the highs and lows of the challenge with the Cocoa powder vs cocoa butter – now that’s a powder keg of a boo boo. The double acetate transfer was her undoing. Brandon had done an exceptional job albeit the texture of the mousse. It came down to Arum and Emily. The comment for Emily’s desert was, “Boom, Wow, Bang” the textures were fantastic. Arum took the 24th apron with a near perfect desert in 3 1/2 hours. Wow, 24 aprons, molecular gastronomy and genius flavour pairings everywhere – it’s going to be a great season! Last night we had caviars, spheres and foams – so easy to do and so impressive. Check out our kits for the tools, ingredients and instructions to make them. Watch tonight’s episode with me! I’ll be on twitter and facebook having my 2 cents worth.